When Sam bites into a dry doughnut, the resourceful jam lover sets a trap to catch the thieves who sucked out the jamminess from his doughnut. 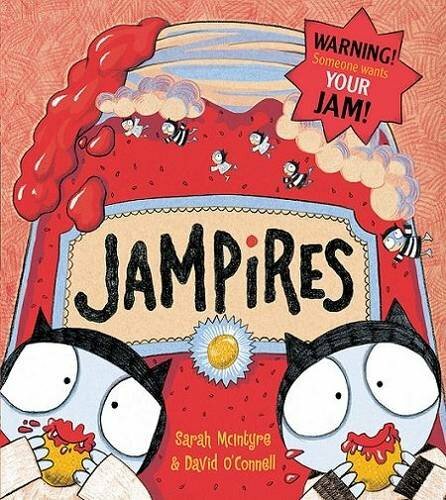 To his delight, Sam captures two baby ‘Jampires’, appealing little monsters complete with delicate fangs. The monsters take Sam and his cat on a magical journey ‘through the star–speckled blue’ to Jampire Land, described as ‘skyberry orchards where Jampire mums perched under a sugar-frost dome’. This edible place is bursting with such a plethora of confection it could become nothing more than a sickly sugar overload, were it not for a clever use of cool colours and restricted palette in the images. Indeed, the chalky textures and pen-drawn patterns set against subtle-coloured backgrounds manage to create a world that is both sophisticated and child friendly. Even better, the Jampire mums are so pleased to have their babies back home, they ply Sam with jammy doughnuts which they deliver to his house every day. The story could have ended here, but by neatly setting up the question of where the jam goes in those disappointingly dry doughnuts we sometimes get, the reader is left with a frisson of excitement and mystery. Jam loving kids will enjoy this!